So last Thursday came and went, and I forgot to blog about our experience celebrating Rosh Hashanah. Rosh Hashanah is a Jewish holiday which means “head of the year” literally. 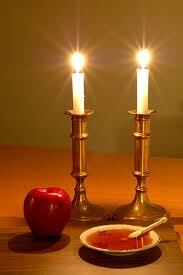 Is it the beginning of the Jewish new year (the new year is 5771). It is the birthday of mankind and celebration of Adam and Eve’s creation as well. The main focus is on God being our King. One of the main events of Rosh Hashanah is the blowing of the trumpets. It represents the coronation of our King, heralding Him with the sound of the shofar. It also serves as a call to repentance (leading into the next Jewish holiday, Yom Kippur). I don’t have many pictures, because in my hurry to cook and clean I forgot to snap a few photos. At any rate, we set a beautiful table with each person having a trumpet (okay, a toy flute, really!) at their plate. I lit the candle and my husband and I prayed blessings over the girls. I had the girls make Rosh Hashanah cards for their dad. I do, at least, have pictures of those…but ignore the misspelling of Rosh Hashanah!! The girls really enjoyed making these cards for their dad. The girls then blew their trumpets (flutes) according to the different sounds associated with the Feast of Trumpet’s service (Tekiah, Shevarim, Teruah, and Tekia Gedolah). Some sounds are short and stacatto blows, others are wave like, or long and unbroken. Each trump sound represents an aspect of our relationship to God and His call to mankind. Where did I learn all of this? This book tells it all. And lastly, we had apples dipped in honey, a tradition that symbolizes a sweet year ahead for you. In reality, we had run out of apples, so we had pears from my parents’ pear tree and garden. Cooked slightly and dipped in honey, they were delish! That's an awesome way to praise our God- shouting and making joyful noises unto Him! I think our own voices can serve as the best trumpets. 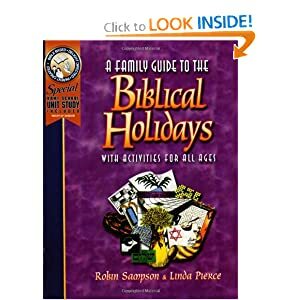 I am new to preparing for the feasts so it is my first year and I am still learning…I still want to read up more on Yom Kippur, which I believe is in just 3 days. Thanks for your lovely comments! So sweet that your kids made cards for their dad. Creative to substitute flutes! I didn't plan early enough and we had no musical instruments. I just had my girls shout and make a joyful noise at the beginning of the holy day. I will be better prepared next year!